This is the beginning of a story that my seven year old created using Story Box which is a fantastic resource to help children (and adults!) create and tell stories using different fairytale characters (the rest of the story is at the end of this blog post). Story Box is a sturdy, colourful box which contains 20 double sided, interchangeable puzzle pieces. An initial piece shows a man, a woman holding a hen and a young boy which already conjures up a multitude of scenarios – Is this a family? Is this Jack and his mother from Jack and the Beanstalk? Are the characters related at all? Or you can turn the piece over and start with a king and a princess standing on the turret of their castle – Who is the king waving to? How do you think the princess is feeling? 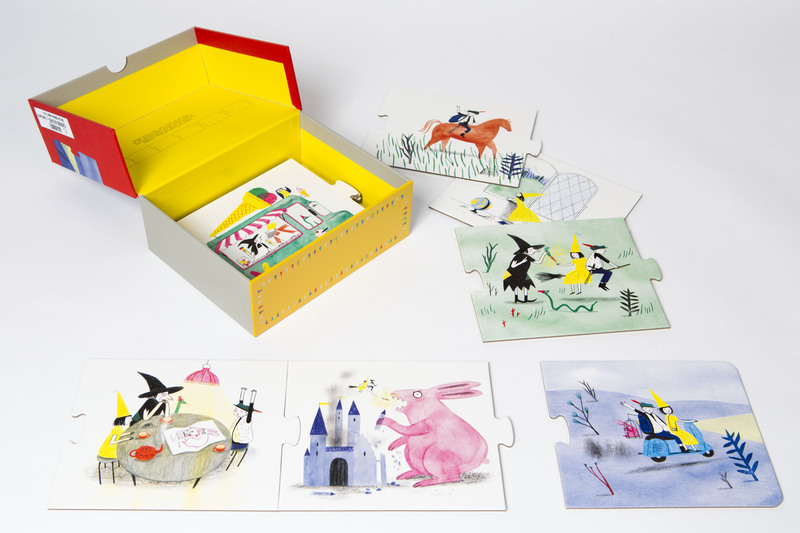 The consecutive pieces show a range of fairytale characters engaged in a variety of activities – there’s a wolf, a witch, dwarves, a pink rabbit, a snake and a king as well as the young boy and the princess. The castle, the witch’s house, the woods and even an ice-cream van provide backdrops for the stories which include references to well known fairytales e.g. a beanstalk, dwarves, apples but they are also ambiguous enough for you to get wildly creative. With 20 pieces you can create a fun, action packed story and there are six different endings to choose from. We love the way that the large jigsaw pieces can be arranged and rearranged to tell a multitude of stories. Anne Laval’s illustrations are beautiful and full of details that can interlink not just one but several pieces together. 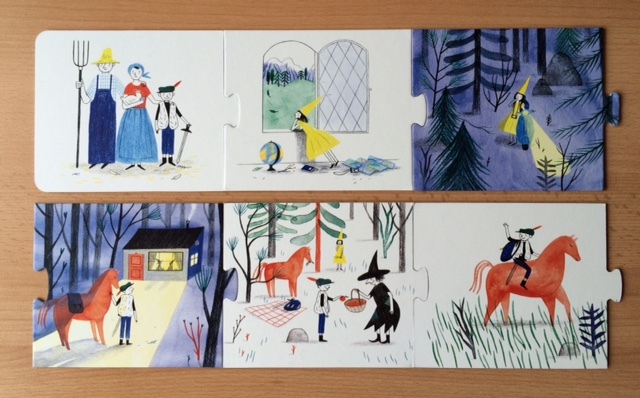 Just turning the puzzle piece over can take your story into a completely new direction, it took my daughter a long time to arrange the pieces for the story that she wanted and there were a lot of ‘what ifs’? and discussions throughout the process. The child creates a story and the parent / teacher writes it out. Having somebody else to write the story gives the child the opportunity to use their imagination without being distracted by the mechanics of writing. The story can be used later for reading practice. Each player in a small group is given several puzzle pieces. When it is the player’s turn they can choose a relevant piece and tell their part of the story. This would be a fun activity to develop storytelling / speaking skills. A teacher, adult or another child writes a story using the puzzle pieces. 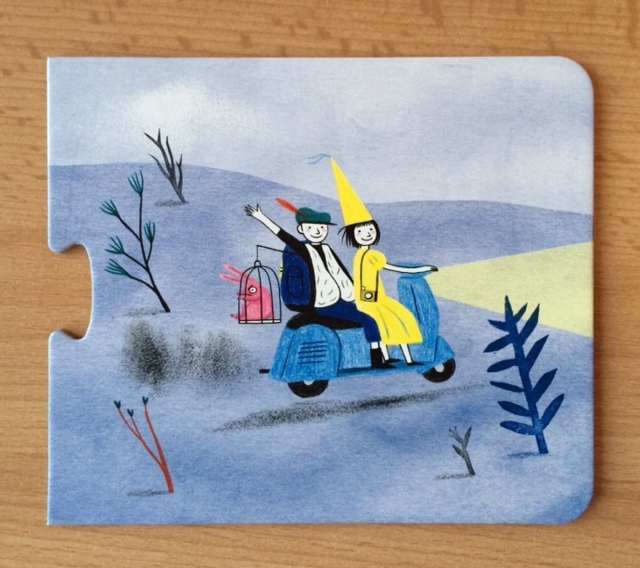 Children are encouraged to find the corresponding puzzle piece and put the story together as the story is read aloud. Children can write out and illustrate the stories that they have created for a class book or a classroom wall display. I first became aware of Story Box after reading Picture Books Blogger’s Story Box blog post – thank you to publisher Laurence King for sending us a review copy. I’m very impressed with this beautifully illustrated resource which has given us a lot of fun. It’s also a great resource to use in any language as you provide all the words! And just in case you want to hear how our story ends! The illustrations are gorgeous and full of so much detail to help tell different stories every time. It’s a lovely idea and great that familiar characters can be mixed to make different stories. We loved this too – such a great idea for encouraging story telling skills. It is a fantastic resource for helping children to understand story structure. Story Box is a resource that could very easily be used with a group of children of different ages (or adults!). It does look to be a lovely resource and it must really encourage children to create their own stories. Not only children – I had fun too! It is a fun introduction to reading stories and a great way to introduce children to the concept of a beginning, middle and end.